A STRANGE, GLITTERY BREEZE WHOOSHED into Athena’s bedroom window one morning, bringing a rolled-up piece of papyrus with it. She jumped up from her desk and watched in amazement as it swirled above her. “Yes, I’m thou. I’m present. I mean—I’m Athena,” she replied in a rush. Abruptly the breeze stilled, and the scroll dropped right in the middle of her science homework. A thrill swept over her. She’d never gotten a message from the gods before! No human she knew ever had. The gods and goddesses on Mount Olympus ruled Earth, but only made their powers known for important matters. What could they want? Was she being given an urgent mission to save the world? She unrolled the scroll as fast as she could and began to read. “Try twelve,” she mumbled under her breath. And for most of those years, she had yearned to know who her parents were. She’d spun endless stories in her head, imagining how they looked and what they were like. WILL PICK YOU UP TOMORROW MORNING. Was this for real? She could hardly believe it! Beneath his signature was the worst drawing she’d ever seen. It looked sort of like a caterpillar, but Athena had a feeling it was supposed to be a muscled arm. She grinned. One thing was for sure, Zeus was no artist. A blazing gold Z shaped like a thunderbolt—Zeus’s official seal—was embossed alongside the drawing. She traced her finger over it. “Ow!” A burst of electricity buzzed her fingertip, and she dropped the scroll. As the sizzle zinged through her, the scroll shut with a snap and rolled across the carpet. No question about it, this letter was from the King of Mount Olympus! Feeling dazed—and not from the electricity—she gulped. She was his daughter. A goddess! Athena jumped to her feet, unsure if she should be happy or upset, but feeling a little of both. Rushing over to the mirror, she gazed at her reflection. Her determined gray eyes stared back at her, looking no different from before she’d read the letter. And her long, wavy brown hair was the same too. With a poke of one finger, she squished the end of her too-long nose up, then frowned at the piggy nose she’d made. She wasn’t sure what she’d expected to see in the glass. To suddenly look beautiful, wise, and powerful? In other words—more like a goddess? She turned as she heard her best friend Pallas come into their bedroom. Pallas eyed her, munching an apple. “What’s that?” she asked, gesturing toward the letter on the floor. “Umm.” Athena quickly scooped it up and tucked it behind her back. Athena thumped one end of the scroll gently against her back. On one hand, she wanted to twirl around and shout the news that she was a goddess! At the same time she wanted to hide the letter in the back of her closet and pretend it hadn’t come. Zeus’s summons was going to change everything. Athena nodded, holding out the papyrus scroll. Pallas pounced on it. By the time she finished reading, her eyes were huge. “You’re a goddess?” Her voice rose to a squeak on the last word. 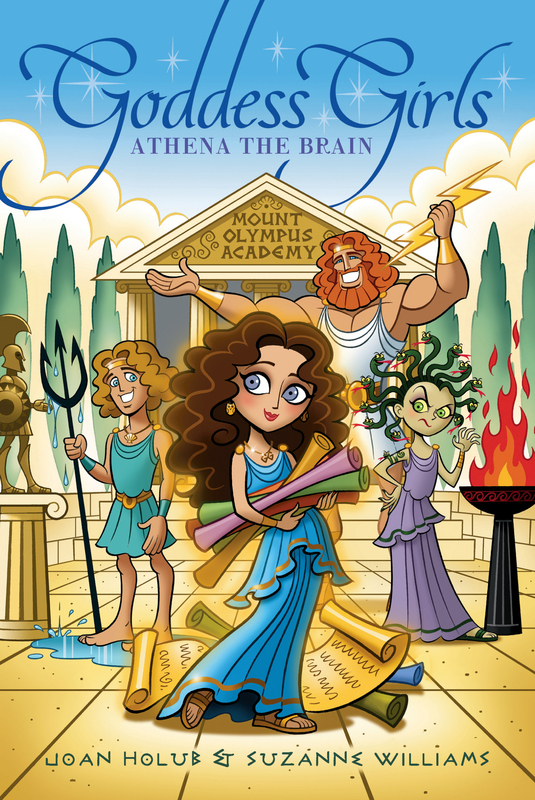 “So you think I should go?” Even as Athena asked, she knew that the idea of going to Mount Olympus Academy was growing on her. But how could she tell Pallas that? She’d be devastated at the thought of Athena moving away. Athena hugged herself and glanced out the window toward the Triton River, feeling a little hurt. It almost sounded like Pallas was trying to get rid of her. She’d lived with Pallas’s family since she was a baby. The two of them had shared this room and been as close as sisters all their lives. “But I’ll miss you, Pal,” Athena said softly. Pallas giggled. “Yours in thunder . . . ,” she mimicked in a loud, bass tone. “Zeus!” they finished together. They fell on their beds in a fit of laughter. “Don’t worry,” Athena said quickly, turning on her side toward Pallas. “I’m sure we’ll get along just fine.” But she couldn’t help remembering that thunderbolt and feeling a little nervous about meeting her powerful dad. She reached out to a toy on her bedside table—a wooden horse named Woody. “I wonder what the academy will be like,” she mused as she idly finger-combed the rope mane on the back of her favorite childhood toy. Athena shrugged, knowing it was true. Her studies here on Earth were so easy they were boring. “And there’s the other stuff too,” Pallas hinted softly. Athena winced, looking away. Weird stuff, Pallas meant, though she was too nice to say it. Like the day Athena had invented the very first flute and trumpet ever seen on Earth, and then played an impromptu concert, even though she knew nothing about music. And then there was the time she’d been reading about owls and thinking how fun it would be to fly. Suddenly her feet had left the ground and her hair had turned into bristly brown feathers. Right in the middle of gym class, too! Luckily, she had changed back almost immediately, and everyone had assumed she’d been affected by some random bit of magic in the air, which might have floated down from Mount Olympus that day. From then on, she’d been more careful about who was around when she did things like that. But some of the kids still nicknamed her “birdbrain” as a result of the episode. While Pallas’s mom and dad checked out that Zeus’s letter was for real, Athena began packing. The two girls spent the rest of the day scurrying around, as Athena prepared to leave the only home she’d ever known. “I’m not taking any chances,” said Athena. Carefully she stuffed the suitcase full of textscrolls written by her favorite Greek authors, including Plato, Aristotle, and Aesop. Then she added her own notescrolls, which contained her invention and knitting ideas, and ideas for science and math projects. By that evening, she’d packed her entire life into two suitcases and one bag. She was exhausted—mentally and physically—but she and Pallas stayed up half the night anyway, talking and giggling about what Zeus and the other gods might be like. “It’ll be my first priority,” Athena teased. Pallas grinned dreamily. “I can hardly wait to tell everyone at school tomorrow that you’re a goddess!” She yawned. “Well, night-night, Athena. Let’s get up early, and I’ll make owl-face pancakes for breakfast before you go. The kind with ears and blueberry eyes that you liked when we were little.” Her voice drifted away. After Pallas dozed off, Athena tossed and turned until sunrise, dreaming of Mount Olympus. In some of her dreams, she was the star of the academy, getting the highest academic honors. In other dreams—nightmares, really—Zeus hurled thunderbolts at her for embarrassing him with failing grades. Before she knew it, morning arrived and she was hugging Pallas’s parents good-bye as they left for work. Just as she and Pallas were finishing the pancakes they’d made for breakfast, there was a knock on the door. Hermes had come, wearing winged sandals, a winged cap, and a knee-length toga. Beyond him on the lawn sat a beautiful silver chariot that was already piled high with packages. “Where are you supposed to sit?” Pallas whispered from behind her. “Good question,” Athena whispered back. And it was curious that there weren’t any horses attached to the chariot. “Hup! Hup! We’re behind schedule.” Hermes pushed some packages around to make room for her. Then he rushed Athena, her bag, and her two suitcases aboard as if she were just another package he needed to deliver. And in a way, she guessed she was. The minute she settled in, mighty white wings sprouted from the chariot’s sides. “Strap yourself in!” ordered Hermes, as the wings began to flap. Athena fastened the strap and twisted around as the chariot lifted off. “Bye! I’ll miss you, Pal!” she called over her shoulder. Two girls from their mathematics class joined Pallas just then, on their way to Triton Junior High. Pallas pointed at the chariot, talking excitedly, probably telling them the whole story of Zeus’s letter, Athena guessed. “Promise you won’t forget me!” Athena shouted. “What?” Pallas shouted back, cupping her ear as she tried to hear. As Hermes flew higher into the sky, the chariot’s shadow fell across a sea of glistening white clouds. “I said, don’t forget me!” Athena tried again. But Pallas only shook her head, looking confused. Still, Athena kept waving until the three girls were only specks walking to school together alongside the Triton River below. Of course Pallas would make new friends once she was gone, Athena knew. But that thought didn’t comfort her a bit. She didn’t want Pallas to find a new best friend! Sadness washed over her at the thought, and a tear trickled down her cheek. She wiped it away. She couldn’t show up at her new school with puffy eyes. Suddenly the chariot lurched. Then it began to wobble and bounce. The wings at its sides flapped wildly as it seemed to lose its balance. The muscles in Hermes’ arms bulged as he struggled with the stick shift to steady the wings. Grumbling, he thumped the dials on the instrument panel with the side of his fist. The corners of jostling packages poked Athena’s arms and legs as she held on for dear life. “What’s wrong?” she demanded. “We’re overweight. Got to offload some ballast.” Hermes eyed her, and for a second she worried he was going to toss her out. Instead he lobbed both of her suitcases over the side of the chariot. “Wait! My notescrolls!” she protested. Heartbroken, she could only watch them fall. Her invention ideas! Her journals! All her thoughts and ideas from the past twelve years had been written on those scrolls. Now they were gone, along with most of her textscrolls. All she was left with was a single bag, which contained some of her clothes, a bundle of knitting, and a biography about Pythagoras she’d been reading. “You could have at least asked which bag I wanted to keep!” she protested. Hermes didn’t answer. By now the wind was whooshing past so loudly she wasn’t even sure he’d heard. As they traveled on, Athena caught glimpses of green fields, blue seas, and cityscapes below. But they faded away as the winged chariot flew ever higher. Soon they began circling the top of a gigantic mountain. “Next stop: Mount Olympus Academy,” rumbled Hermes. Athena leaned forward trying to see it, her long hair whipping in the wind behind her. With a burst of speed the chariot broke through a fluffy cloud. Up ahead, her new school sprang into view almost like magic. The majestic academy gleamed in the sunlight atop the highest mountain in Greece. Built of polished white stone, it was five stories tall and surrounded on all sides by dozens of Ionic columns. Low-relief friezes were sculpted just below its peaked rooftop. Looks like I’ve traded Pallas for a palace, thought Athena. Below in the courtyard, dozens of students were rushing around. Everyone seemed to have someplace to go. These were godboys and goddessgirls, she realized. How strange to think that she was one of them. Were they nice? Would they like her? Athena clutched her bag tight. “Too late to change your mind now,” said Hermes. How had he guessed she was having second thoughts? He touched down at the top of the granite steps leading up to the school and scooted her out of the chariot. Then, without another word, he took off in a rush, leaving her behind with her bag. Probably had another urgent package to deliver. He’d left her standing in front of a huge white door. Letters chiseled on it read THE OFFICE. A water fountain stood just outside. Parched from her journey, Athena bent to take a gulp from it and quickly discovered that, instead of water, it spouted some kind of juice she’d never tasted before. It was so delicious that she took a second drink. When she straightened again, she noticed her hand looked kind of weird—like it had been powdered with golden glitter. Tilting it side to side, she saw that it sparkled in the sunlight. So did her arm. So did both of her arms! And her legs, too. Her skin had begun to shimmer—just like a real goddess!